Is there anyway to save these after they are created? I have a couple of deck building games that draw from a large pool of decks depending on the scenario or randomizers. Some of these have mutliple card backs, which I believe can only be created using the milt-token component. Will I have to create a "library" Save Game that has all the decks and then copy & paste them on the actual playing table running another instance of BGE? You should download the Zombinion game conversion for BGE to see how it was set up. It's based on the game Dominion, a well-known deck-building game. In general, if I need card decks with different images on the card backs, I will create each deck separately using the Create Card Deck command. Multi-token components are something else altogether. Your "Library" idea is a valid way to go. See here for an example of such a setup. I actually had downloaded that - the contents are all .CXT and .BGD. I don't understand how to create a card deck with multiple backs any other way than what you showed in the tutorial video for Aliens TTW, which was by doing a multi-token component. The Create Card Deck only seems to offer the ability to designate one image as the card back right after that option is selected. I've searched through the manual and have't found anything about saving decks to load later. CXT files are only referenced a few times at the end of the manual and only under "Purging Obsolete Media" and "Updating from an Older Version of BGE"
CXT files are what gets created when you use the Export Game Media command (see pg. 124 of the BGE User Manual). Any units (components and/or minis that you place on the game table) can be saved, either to a Game File (saves everything, see pg. 122), or to a Deployment file (saves just the units you have selected, see pg. 123). Say I need a card deck with 3 different card backs, Red, Blue, and Yellow. I make a folder in my Components folder containing the cards that will have the Red card back, and I name the folder "Red Cards" (for example). Then I create a card deck in BGE and select the Red card back image from that folder. My Red deck has now been created. I then do something similar for each of the other two card colors. 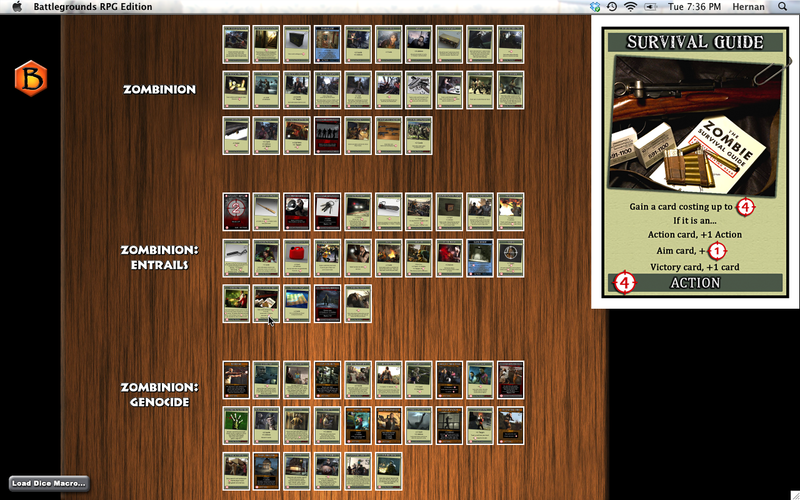 Then I stack all the decks together, if I want to, and even shuffle them together if the cards need to be all mixed up. Got it - so there's no way to create a multi-back deck "in one shot" or to save that deck for future recall unless it's left on a Game Board intact and copied/pasted? In essence multi-backed decks are compiled from multiple individual decks - if this is the case then I think the only solution would be a "library" set like the Zombinion example. Would I need to delete all the decks not being used or can you copy and paste only the ones you want into another instance of BGE? rochambeaux wrote: Would I need to delete all the decks not being used or can you copy and paste only the ones you want into another instance of BGE? NOT in another instance of BGE. Merely paste them into another Game File, such as one you set up to play on. One game file is essentially your Library, the other is your playing area. No need to delete unused cards from the Library, since you'll be loading another Game File and "clearing the board" that way, so to speak. rochambeaux wrote: Got it - so there's no way to create a multi-back deck "in one shot"
There is the method you saw with the Character cards in the Aliens tutorial video. Just put all your "front" card images into one folder, then make a multi-token component out of those images. Then break it up into individual components. Fan out the deck so the cards are nicely spaced. Now make another folder and fill it with the images of the card backs. Make another multi-token component, and split it into individuals components, just as you did above. Fan out the deck right below the first fanned-out deck. You should now be able to merge the front and back of each card into a single component. Do this as many times as required, then stack all your cards back into a deck. OK - I was doing it a bit different but essentially the same end result. I had all the images (front and back) in one folder - did multi-token component, fanned them out and then just married 'em up that way. Once that's done is there anyway to "save" that as an entity that can be loaded on demand or does it only exist on the game board it was "assembled" on? **Solved** I didn't catch on to what exactly "Save Deployments" did - it's exactly what I needed for building custom decks with more than 1 back - I can then just save it as a deployment and load them as needed! Glad you got it figured out. Yes, Deployments are one way to do this. A "Library" game file would have been another. I prefer the Library approach, since you can easily preview all the cards, read them, and analyze combos prior to making your final selection. Copy the ones you want into the clipboard, load the Game file for actually playing the game (which may include tokens, player mats, or other components) and paste them into play.